In 1926, an American author by the name of A. A. Milne began publishing a series of children’s books called the Winnie the Pooh series, and were inspired by the imagination of his real life son Christopher Robin Milne. This series of books about a cute little teddy bear going on fun little adventures have become beloved literary classics but the characters true fame began in 1977 with the animated Disney classic titled “The Many Adventures of Winnie the Pooh”. This was the 22nd classic animated movie from the Disney studio and was basically a collection of three short films. 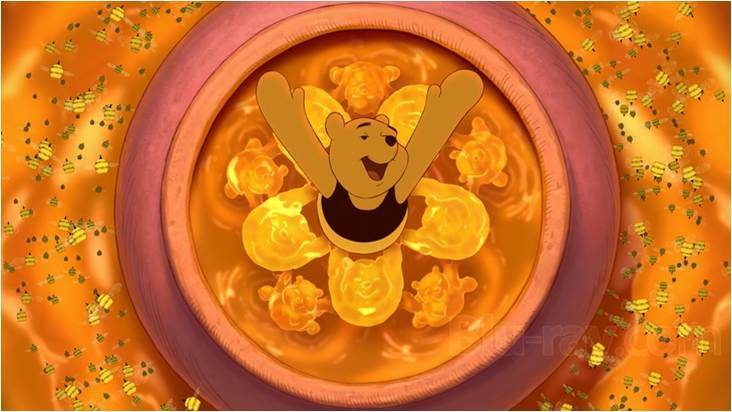 While not one of the absolute best animated Disney movies, it still made an icon out of the character Winnie the Pooh, who quickly became one of the most celebrated characters from Disney and one of the most beloved children’s characters of all time. I remember liking the movie “okay” as a kid, but what I really loved was the 90’s TV show “The New Adventures of Winnie the Pooh”. That’s where I really fell in love with all these characters as a kid, and I just couldn't get enough of it, that theme song is still stuck in my head after all these years. 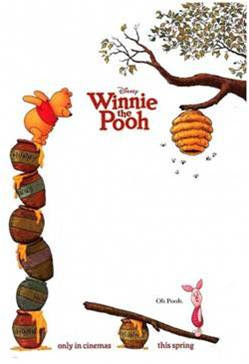 There were several other Winnie the Pooh movies distributed by Disney TV studios, some of which were actually released in the theater but there was never another classic distributed by Walt Disney studios, that was until 2011 with the release of their 51st animated classic simply titled “Winnie the Pooh”. That title may be a little too simple for the films own good but never the less this is a rare traditionally animated movie from Disney and here’s my review of it. I’m not sure if this is a remake or a continuation because there’s new things here but there’s also a few changes too. Some of the familiar stomping grounds like Pooh’s thoughtful spot are absent but the characters that we all know and love are back, some with improvements and others are a little downgraded. It’s an instant joy to hear Jim Cummings continuing to do the voice work for both Winnie the Pooh and Tigger after over 20 years. Unfortunately none of the other familiar voice actors continued their parts from the show, and that was really distracting. 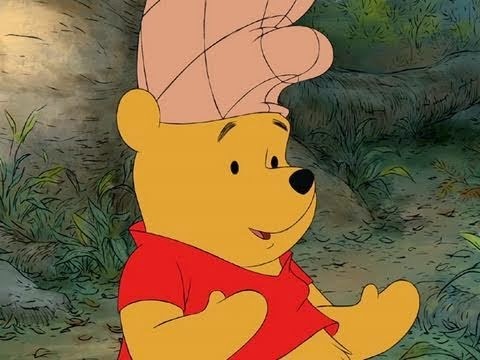 But most of the characters are still the same, I actually feel that Winnie the Pooh is far more charming and lovable in this film than he was in the original movie and it was such a pleasant reminder as to why everyone loves him so much, he’s like the most purely innocent creature in existence. Tigger get’s a surprisingly smaller part than the others, which was somewhat disappointing because he was always my favorite character. 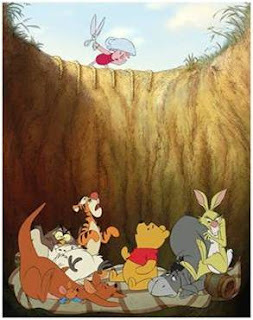 Piglet get’s a really small part too but Rabbit gets his fare share of screen time. Owl is given a lot of attention and is far nuttier than before, at least I got to hear him say “Dash it all!”, that's always great. 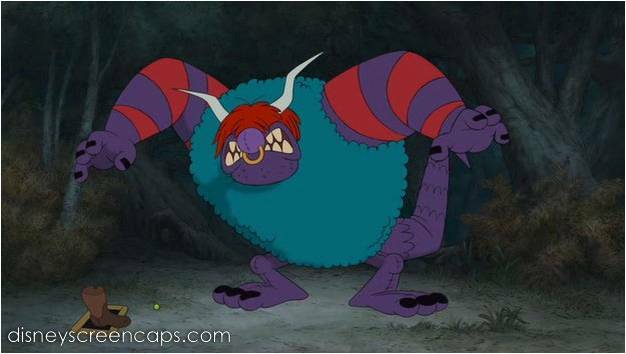 Christopher Robins design was properly improved on, now with big Disney eyes as opposed to the dot eyes of before. 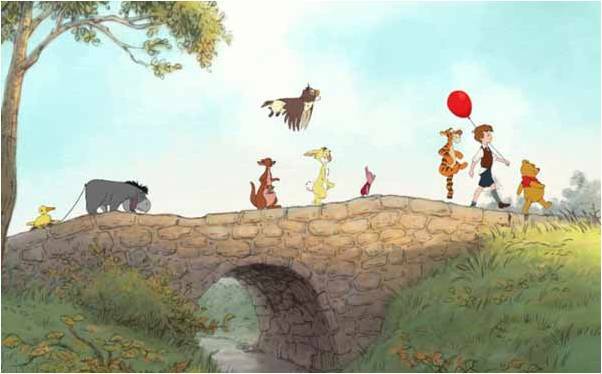 Both Kanga and Roo are in the background for most of it and Eeyore get’s this really big part in the film for some reason, heck they dedicate half of this movie to him. But my biggest little annoyance would have to be that Gopher wasn’t in this film, because he was a character that I always looked forward to. I mean, I know he wasn’t in the original book but he was a main reoccurring character in the TV show and was even in the original movie “The Many Adventures of Winnie the Pooh”, so why not have him in this film. 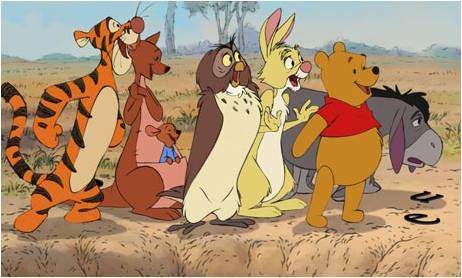 Well it doesn’t matter too much, there is still this genuine charm that comes from seeing all these characters again and it does make for a genuinely nostalgic return to the Hundred Acre Wood. It’s also a real treat to get one of my favorite comedy actors John Cleese as the narrator, who’s both funny and dignified. Unlike the first movie which was a compilation of three short cartoons, this film is one linier story. Now there are a few subplots, like Eeyore looking for a new tail to replace the one he lost and Pooh looking for more honey but the main plot is a lot more fun. Pooh and friends fear that Christopher Robin has been captured by a monstrous creature called the Backson. So they all band together to try and capture the beast in order to free their captured friend. 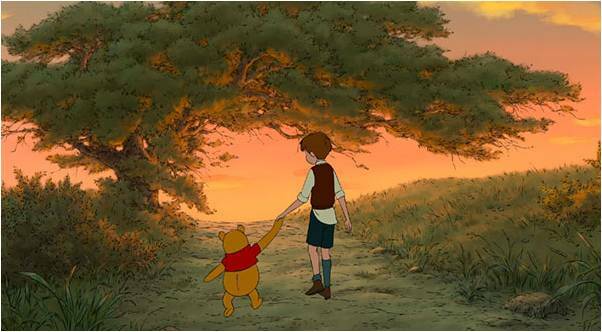 A lot of this plot is actually based on events from the film "Pooh's Grand Adventure: The Search for Christopher Robin", so it may not be that original, but it's all done in good taste. Of cores when we see the Backson, he’s just this silly oaf of a creature that collects things that are lying around. While the creature is nothing special, his villain song is actually one of the most enjoyable I've heard in years. Seriously, “The Backson Song” has a lot of energy, fun lyrics and this really unique chalk drawn animation style. Actually the music in this film is quiet good, it’s not up to par with the really great musical numbers from Disney but by Winnie the Pooh standards, these songs are surprisingly fun and by that I mean really good for children to listen too. Tigger gets this song called “It's Gonna Be Great” which is okay and a bit catchy, the end credit song called “So Long” is nice & sweet and the credits themselves are also really fun and crafty, with still pictures in the background and the characters playing around with the rolling credits. There are musical numbers like “The Tummy Song” which are very upbeat and reminiscent of the first movie. Heck a few of the original songs even make it in this film. We get to hear the original classic “Winnie the Pooh song” and even a short reprise of “The Wonderful Thing About Tiggers”. Now there are a few songs I didn’t care for, like this “Winners Song” which plays several times throughout the film and there’s a lot of small songs like “A Very Important Thing to Do” which carry their own little charming melody but are very forgettable. The song titled “Everything Is Honey” is easily the best and most memorable, not just because the song is catchy and sweet but also because it looks so cool, the visuals and artistry of this musicale number are just fantastic. In the end we get “Pooh's Finale” which is a nice little collection of the previous musical numbers. These songs were written by Robert Lopez and his wife Kristen Lopez, who also performed three of the songs (“Winnie the Pooh song”, “A Very Important Thing to Do” and “So Long”) as well as provide the voice for Kanga. One minor disappointment was that the song "Somewhere Only We Know" performed by English alternative rock band “Keane” was not featured in the film, yet it was in the trailer and it sounded really good. I really wish they could have fit that song in the film somewhere because it was an excellent song and sounded really wholesome. Not only is this a return back to traditional 2D animation, as opposed to all those CG animated films that get released all the time, but this is a return to old school Disney animation. The backgrounds are sketchy and you can see the pencil drawn outlines on the characters. This isn’t a complaint by any means, I thought the animation looked fantastic. There are also a lot of really clever jokes thrown into the animation, most notably when the characters run into the actual words of the book their in. There’s some really fun forth wall jokes and a surprisingly funny aroma of clever lines between characters. The films climax is a scene with all the characters getting stuck in a big pit, and I can honestly admit that from the perspective of a 21 year old, that I got some honest and genuinely big laughs in this scene. I’ll admit, the ending came off as very sudden to me, almost too sudden and it got me asking myself, “What the heck did I just watch?” Overall, it’s not a great movie or anything stellar and I don’t think I’ll be watching it again anytime soon but I am still really glad I saw it because for what the film is and for all that it aims to be, “Winnie the Pooh” is a very gentle, charming and wholesome family film that I highly recommend to kids or anyone who’s still very young at heart. It’s not a movie that will drop your jaw but it will provide a few genuine laughs, some nostalgic memories and a few whimsical charms. I give “Winnie the Pooh” 3 stars out of 5.